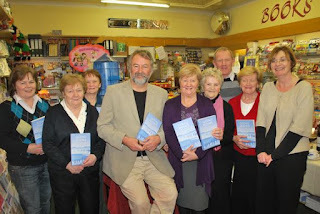 Prominent religious, sports and popular psychology writer and ex-RTÉ producer, Colm Keane (here he is at a book signing), appeared on Tubridy a couple of weeks ago, selling his new book tapping into the religious bereaved market, Going Home: Irish Stories from the Edge of Death. RTÉ are apparently so proud of the interview that the piece appeared on Playback for the week that was in it and can still be heard as a podcast to be downloaded from RTÉ's website. I apologise for the delay in posting this blog on said interview (it happened on 20 January), but I should say I did post a few lines on the day itself on the subject on Ireland's premier politics chatboard, politics.ie. However, the thread I started on the subject was understandably locked by the site owner at the behest of Mr. Keane, who issued the most blood-curdling threats of libel action if it was left up. Accordingly, I decided myself to have a little chat with some legal advisors. The present post has been given the all clear by said advisors and omits nothing that was said in my original posts to politics.ie. I should make clear that my reasons for posting this here have nothing to do with any personal animus against Mr Keane. I know the man only by his work (his soccer book, Ireland's Soccer Top 20, for example, is both useful and entertaining: his exclusions from the top 20 are pleasingly controversial). My reasons are twofold: that the interview very neatly illustrates a large number of the peculiar habits of broadcasting rampant in the station that prevent it from providing a public service to the Irish viewer and listener; and because the juxtaposition of the two parts of the interview were simply breathtaking in their irresponsibility and unprofessionalism (but more of the latter issue later). The first of my reasons for objecting is the willingness of the station to treat with chamois leather any old snake oil that has a religious hue to it, as long as its sheen is respectable (i.e. is not what Ireland's standard religions regard as 'cultish'). In my view, the habit is partially the result of a strong religious lobby within the station and partially due to RTÉ's view that its task of providing space and respect for the 'voices' of Ireland (and not to offend such 'voices', no matter how sensitive) trumps their responsibility to provide wide-ranging and balanced information on matters of controversy. It is not unconnected also to their absurd implicit (and occasionally explicitly expressed) view that if they're getting roughly the same amount of stick from all sides, they're getting it about right (forgetting the old adage about empty barrels and decibels). Thus, while such international luminaries as Prof. Richard Dawkins are automatically roasted over the airwaves (most recently by Marion Finnucane and Ryan Tubridy), independently produced hagiographies of Pio are bought and broadcast, programmes are made in-house in praise the founder of Opus Dei (by their news and current affairs people, no less) and obvious snake oil merchants (especially those who still have good contacts amongst senior RTÉ staff) with nothing new to sell are given free publicity. Now the particular variety of snake oil this book is dealing with (near death experiences as evidence for an afterlife) was briefly in vogue amongst conservative publishers such as Reader's Digest in the 1970's, but went out of fashion by the end of that decade in the developed world. Keane adds nothing new to the subject, except perhaps to give an Irish angle to this dead, dead, dead topic. And yet his book, not even newly published (it came out during the middle of last year), is given a large and very friendly slot on national radio at a time of high listenership and is repeated at the weekend. The airing of the subject on a public service channel is utterly inexplicable from any professional point of view. Anyone who doubts my opinion on the low and unoriginal quality of Keane's religious wares is respectfully referred to his previous effort: Padre Pio: The Irish Connection. The blurb on the back cover will give you a taste of it: "... this remarkable collection if stories is crammed full of miracles and cures attributed to Padre Pio's intercession. There are accounts of scientifically inexplicable recoveries from cancer, heart disears and brain damage, along with revivals from blood clots, strokes, multiple sclerosis and life-threatening viral infections. Also featured are visions, apparitions and supernormal coincidences." Keane tantalisingly suggests he's not a catholic on this particular promotional appearance, no doubt to keep up with his changing market. At the very start of the interview, he declares himself to have been a skeptic when he started. And later, he speaks approvingly of people who actually stopped attending religious services on having a near death experience. Tellingly, Tubridy makes no comment on his authorship of the Pio book, which would have automatically rubbished any claim of the interviewee to skepticism in the face of the supernatural. Indeed it's soft soap for his book all the way. Atheists are mentioned as possible objectors to Keane's ideas on the subject and not further mentioned. It is admitted that alternative scientific explanations exist and such theories are left undiscussed. Nothing searching or critical or even probing is suggested or asked. Now the percentage of religious broadcasting as a proportion of general output on RTÉ is down near the European average. I'm reminded of this every time I send a complaint to RTÉ about their excess of religious broadcasting. But of course, the Keane interview does not count as religious broadcasting. Any public service broadcaster in Europe, in the unlikely event they were willing to broadcast such material, would have consigned it to their religious programming. Not at RTÉ. At the national broadcaster, like at Ireland's national schools, religion is not confined to religion class; rather, it permeates the whole school day. Of course it's not all about RTÉ's penchant for promoting religion, in Colm Keane's as in many other cases, historical associations with RTÉ probably have quite a lot to do with it. Keane is an old friend of RTÉ's. He was a producer and broadcaster there for many years. And this is another of RTÉ's anti-public service vices. I believe this is the main reason the interview was arranged. 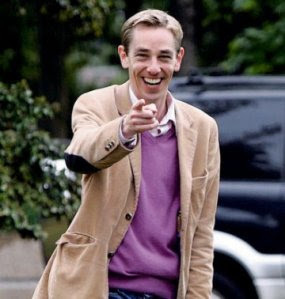 Tubridy knows Keane personally and says so on air. Much is also made of the school both Tubridy and his late son (more of him later) shared (it was Blackrock College -- which, incidentally, is also where I went to school, much earlier). Nobody seems ashamed to admit that the man is getting a hearing because he's a pal. Whether this is a comment about attitudes in RTÉ or in Ireland is a moot point. But the most shocking aspect of the interview (almost 30 minutes long in total) were that more than two thirds of it did not discuss the book at all. The last 20 minutes of the piece discussed in very emotive terms the tragic death two years ago of Keane's young son of cancer. Of course, in itself, a story picked at random of the death of a loved one can produce good, bracing and informative radio, and even if there was nothing particularly notable about the death amongst thousands of other similar tragic deaths of young (or indeed old) people without celebrity status, there may be a professional justification for broadcasting such a story. This is especially so where the storyteller is someone as articulate and radio-literate as Keane. But there is no such justification in this case. The first point against this particular 19 minutes is that there is already too much of this sort of emotive broadcasting on RTÉ. Indeed invitations to emote seem to form as much part of the ethic of public service broadcasting on RTÉ as religion, and seem to trump any requirement for mature debate on the political issues always lurking in the background of such situations. RTÉ should be trying to reduce such broadcasting moments, no matter how much it provides occasions for tearful empathy for its listeners: its responsibility to inform is often compromised by the hysteria such stories produce (just as the BBC's ability to inform its public was compromised by the broadcast emotional breakdown that followed the death of Diana in 1997). The second reason for objecting to the second part of the interview is more dissonant, more unpleasant (indeed it is probably the reason that Keane wanted to sue politics.ie for hosting my first remarks on the interview), and it is more damning. It is an occasional practice in broadcasting to tell such tragic stories as that of Keane's late son in juxtaposition with some charitable appeal in aid of some cause connected with the death being discussed. But in this case the cause being promoted was simply the sales of a book whose subject had only a very tenuous link to the tragic story. The book, as far as I know, is not being sold for charity. To spell it out, on cynical me (and on a few less cynical people I know) the overall impression given by the half hour interview was roughly the following: "À propos of nothing: buy our pal's book. Go on do, ah shure don't you know his son died fairly recently. Please." The best you can say about Keane allowing himself to become involved in this embarrassing stuff is that it was unbelievably naive. (He's a long-time broadcaster and ex-head of communications at NUI Maynooth.) Whatever about that, RTÉ's use of the material in this tasteless manner was quite literally unforgivable for the total lack of public service broadcasting values it displayed. The fact that RTÉ is apparently still proud of this ugly piece of radio is just astonishing.